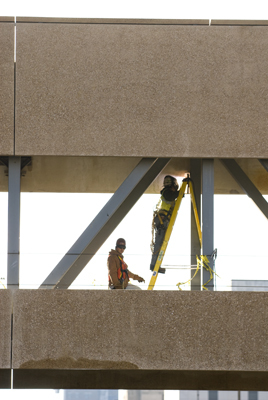 Construction continues on the skywalk projects at the Birmingham-Jefferson Convention. The renovations to the BJCC include the construction of two exterior bridges connecting the Sheraton Birmingham hotel to the North and South Exhibit Halls as well as the BJCC Arena. The bridges are due to be completed by this July and are part of the complex’s six-year, $52 million capital improvement project.